munros young st the one on the corner tomna st may have been crawfords? I used to sell Telford rolls all over Inverness.At any one time I'd have 25 or so teenagers delivering rolls to houses I'd previously canvassed.I'd cycle all over town every couple of weeks picking up all the cash for the previous fortnights sales.By the end of my trip my rucksack would be full of small change and be so heavy I could hardly lift it.I'd spend the next day counting it all out and bagging it.I'd then cycle into The Clydesdale Bank and get there just as they were closing.I'd plead with them to let me in because otherwise I was stuck with this pack full of change.I'd then head down to see 'Mrs Roll/Bartniczeck, give her the bakeries 'cut' and then blether about life for a while.The Bartniczecks were lovely people.How they put up with me and my appearance (straight out of Woodstock 1969 ) I often wonder.10 or more years after I'd finished this enterprise people would come out their houses and ask me if I'd any rolls for sale. Do you remember Marshall Grant (previously Notman) leavinh his mini van running driverless in 2nd gear down the street while he ran to and from it, delivering rolls to various houses? I dont.When I started as a teenager in Balloch Mr Bartniczeck (senior) would pick us up in his wee van and deliver us and the rolls to wherever we were selling them.He had triple glazed glasses on and struggled to see out the window.Laterly his son took over the driving and would run the rolls all over town to the kids I'd recruited houses.The Bartniczecks were hard working , up every day at 4am.I was 'sleeping for Scotland 'at the time rarely rising before mid day.Mrs Roll would occasionally phone me and my mother would wake me up and I'd have to sound as if I'd been up for hours . I don't think that's the correct spelling. I think "Bartincek" may be closer but not necessarily completely correct either. Bartniczek. I know this cos I was in school with his son Richard. Really nice family. Peter - was the Skinners bakery at #17 Kenneth St in what is now Victoria Wine on the corner of Kenneth St and Tomnahurich St? Certainly when I was a teenager, the shop on the corner of Kenneth St and Tomnahurich St was one of two licensed grocers - of which one was Alexander Fraser's - which were famously willing to sell to well-under agers! That's the one Bughtmaster! Stuart Walker was on the corner and Alexander Fraser was on Tomnahurich St itself, diagonally across the road. I remember going into Fraser's once, aged about 14, and saying "A bottle of cider please" to which the guy replied "which kind would you like son?" Skinners was at the junction of Kenneth Street and Attadale Road which was where John Harrison had his first shop as Highland TV Services after starting in Falcon Square, it is now the art gallery. Inversnecky now has an "art gallery" ? !!!!!!!!!!!!! Fond memories for IHE of the building where he went to school. When I was working as a CA apprentice back in the early 80s I remember that one of our jobs was to go to Munros the bakers in Tomnahurich Street every morning to collect the cash from the shop from previous day before checking and banking. It was also the chance to get (most times) a free snack for our morning office break. I'm torn between the pies and the cream cookies as to what was best! were either irrepressible or just plain precocious? Myxamatosis? Why, I'm beginning to warm to you . didn't have time in the morning to use your...Rolls.... razor as much as anything? were either irrepressible or just plain precocious? Myxamatosis? A teenager? I was four! I am doing history of the bakers of Inverness and would appreciate anymore information. Hi - I realise this thread is a few months old now but was interested in the above. I'm the youngest daughter of Alistair Skinner who owned Skinners the Bakers - info on here is correct - there was a shop at the bottom of Stephen's Brae and one in Kenneth Street and I worked in both! All the family did. That's how we earned our pocket money! 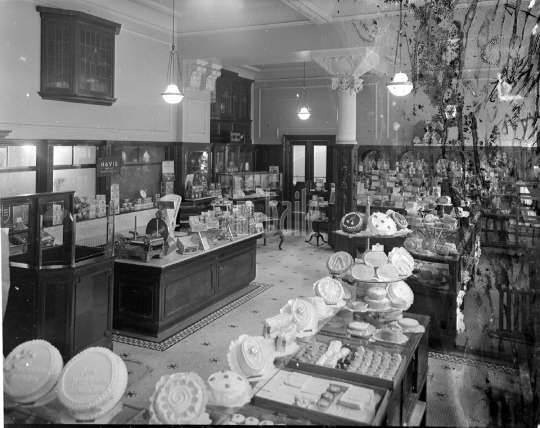 The original bakehouse was behind the shop in Stephens Brae but in latter years it was moved to larger premises in Argyll Street. Dad died suddenly in 1976 - he'd had a heart attack in December 1975 and was making a good recovery but got flu and his body just wasn't strong enough to fight it. Mum kept the business going for a few years after that then sold it to a hairdresser I think. And yes he was very active in the BBs - a regular churchgoer in the East Church of Scotland, sang in the choir, was a BB officer, took the Young Brothers for years as well as running the badminton club - also did some lay preaching in his spare time. Are you doing the history for any specific reason? I'm researching two ancestors/relatives of mine - Thomas Skinner and his daughter, Ray Skinner. I believe Thomas Skinner was a master baker in Inverness. At the moment, I don't know much about Tom or Ray. But am wondering if this Tom Skinner is the person you're talking about? A prodigy at four years old.